Fill out our simple form and get quotes from local jazz bands. A jazz band will bring laid back tones and mellow harmonies to your party, creating nothing but a magical atmosphere. Whether you opt for traditional jazz band hire or fancy treating your guests to the ‘great American songbook’ of jazz classics, you’ll find jazz bands for hire here. All musicians are of a high standard and will deliver professional performances for your event. We are a Devon based big band who are available to play at weddings, functions, parties, and basically anything else where you want jazz music from across the ages! A musical ensemble that’s brought together with impeccable rhythm, jazz bands come in all shapes and sizes and perform music from across the decades, and the globe. 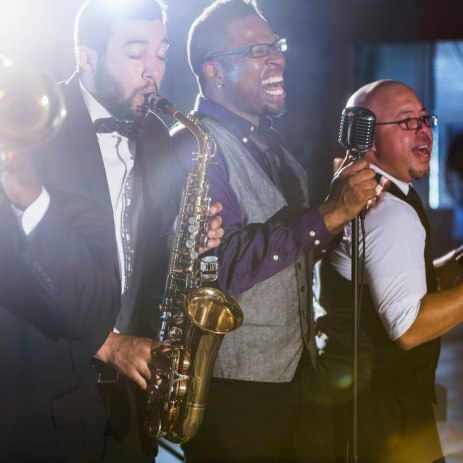 From 1920s dixie jazz, to 1940s swing jazz, to more modern day jazz bands, bring the vibes of the great South to your event. Step back and imagine your wedding or event in full swing, with your guests enjoying food and drink, your venue looking fantastic and the rhythm of jazz begins to fill the room. Whether it’s background music to pull everything together or a show to end the evening, jazz band hire is definitely an option to consider for any event. To find a wedding jazz band or any kind of jazz band for hire simply browse our suppliers here and submit a free quote request form to start planning your party today.